Nobody wants a cracked, faded dashboard or worse, cracked and faded seats. The best way to avoid sun damage is with a Jeep sunshade. This foldable sunshade for Jeep Wranglers blocks out damaging UV rays and heat, keeping the inside of your vehicle safe. 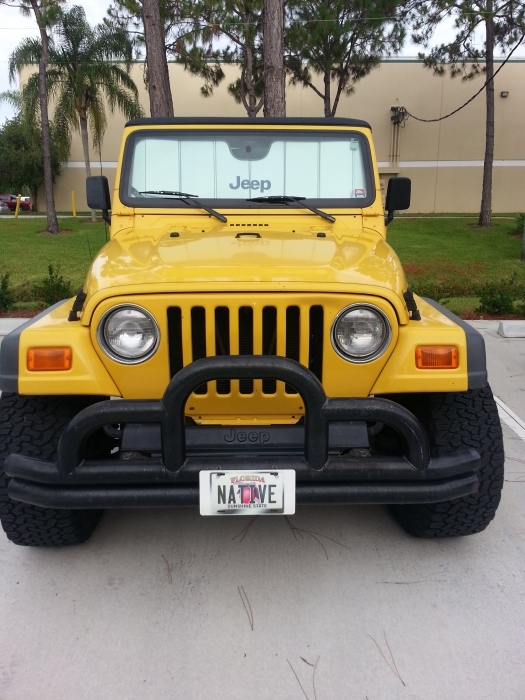 It features a Jeep logo front-and-center while providing superior protection, and the best part? 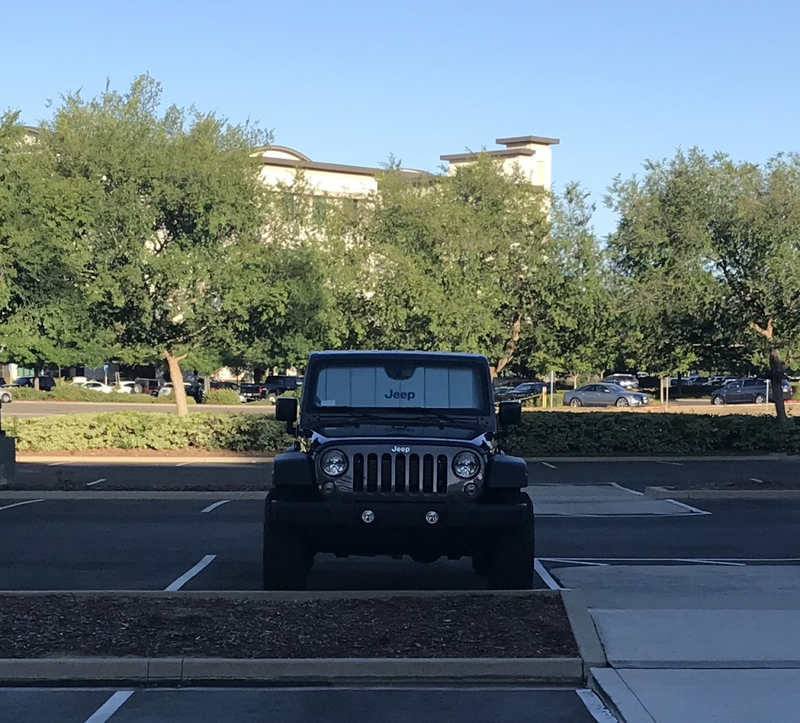 It only takes seconds to set up when you leave your Jeep. Measures approximately 53" x 16"
Really great quality. I have dash speakers, and even added grip bars, and it still slides in easily. Fit very nicely on the front window. Easy to use and comes in a nice bag for storage. Install in less than 20 seconds. ConsJust noticed a discount from my purchase price&#128578;. The sunshade is very well made. It�€™s thick, sturdy and well insulated. I just brought home my new Jeep Wrangler JL and the windshield shade fits very well! It is made well and seems like it will be quite durable. ProsThe quality and durability. That it folds up. The storage bag. I love my Jeep sunshade, perfect to Fit! My Jeep loves this shade. It is perfect and keeps the interior so much cooler than without even when it is 105! Perfect fit, great coverage. Just need to rotate mirror a bit to clear when positioning. Product fits good am pleased with coverage. I was hesitant to purchase this item because it's a bit pricey. I have NO regrets! This sunshade fits my 2017 Wrangler perfectly and I love that it comes with a sleeve. Worth every penny! Not your normal sunshade. Amazing!! perfect fit for my wrangler. easy to use and has a storage bag. the sunshade is a perfect fit and it's will made. My Jeep doesn't get as hot. Great sun visor. Little pricy though. Great sunshade - looks fab on my 2000 Wrangler Sport. Easy to install, just insert into windowshield slot, slide back and forth to get around mirror, lay down visors and presto! 5 seconds max! I wish the storage bag were slightly bigger as I feel once the shade gets broken in it may be difficult to put it in the bag as it is a really tight fit. It actually takes longer to put in and out of the storage bag than it does to install or take down the shade itself. I also think it's a little overpriced but what do you do? They have the plain ones for less, but having the Jeep logo looks so cool and this shade does the job! :) I am very pleased with this product! ConsPrice Storage bag could be bigger. This was expensive but worth the cost. Jeeps are notoriously difficult to find a windshield sunscreen because of the small windshield. This one fits perfectly and is well-built. Should last a lifetime. Best sunshade ever! Worth the $! ConsOverpriced, "Jeep" should be written in black. Fits great and keeps the jeep cool! The sunshade is exactly what I needed for our Jeep Willys! ProsExtremely well made - very durable (unlike the flimsy "silver" shades often seen) and will last. It is an exact fit and fully covers the windshield. ConsMinor adjustment of the rearview mirror is needed to place the shade, but once done, it's a great fit. Ready for the Hot Weather Now ! Arrived faster than I expected. Takes a little patience at first, as you have adjust the rear view mirror to put in place and and after your remove it. Love the visor appears to be very durable. Would recommend this to others worth the money. Had a little bit of trouble fitting it in because of the mirror but after a few tries fit perfect. Got it in exactly the 3 days it said it would take to ship. ProsFits perfect and was easy to get in. My Jeep has little speakers in the corners of the dash which makes it more difficult to place. Worth the high price. Okay delivery time. Nothing extraordinary. Expensive, but worth it. Fits perfectly and is great quality. It fits perfectly in my 2015 Willy's Jeep! Just what I wanted.